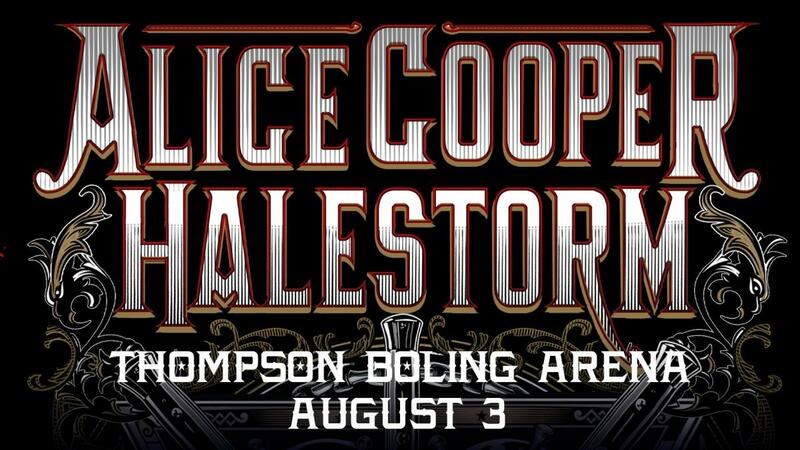 Rocker Alice Cooper returns to Knoxville on Saturday, August 3, 2019 with guest Halestorm. Tickets go on-sale Friday, April 12 at 10:00 am! Alice Cooper pioneered a grandly theatrical brand of hard rock that was designed to shock. Drawing equally from horror movies, vaudeville, and garage rock, the group created a stage show that featured electric chairs, guillotines, fake blood and boa constrictors. He continues to tour regularly, performing shows worldwide with the dark and horror-themed theatrics that he’s best known for. With tour plans for North America, the UK and Europe in 2019, as well as the release of a new album mid-year, Alice shows no signs of slowing down. And, with his influence on rock & roll and popular culture long since acknowledged, there is little that Alice Cooper hasn't achieved in his remarkable career, including platinum albums, sold-out tours and any number of honors and career achievement awards. • One Lucky VIP will be chosen to join Alice Cooper on stage for an end of show balloon toss! **Halestorm VIP Package DOES NOT include a ticket. You must purchase an event ticket in order to be admitted to the VIP activities.